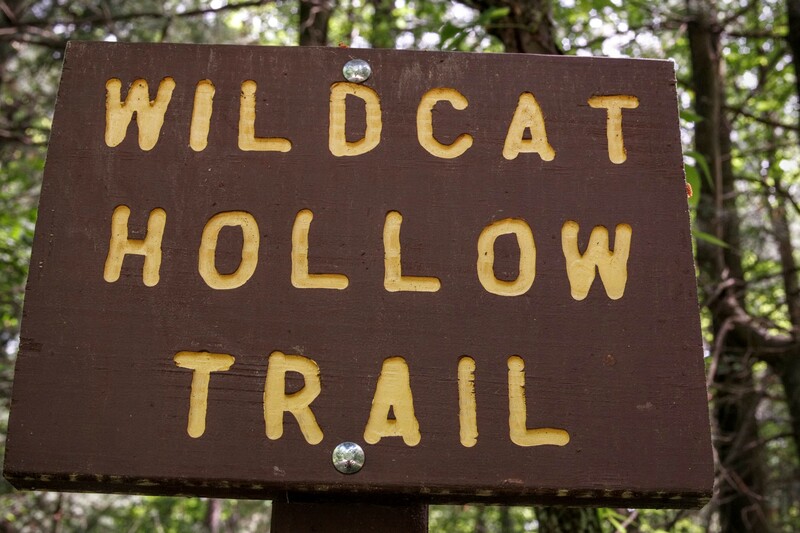 Wildcat Hollow Backpacking Trail is a moderately challenging 15 mile loop trail in Wayne National Forest. The trail head is in Southern Ohio near the town of Corning. It is also close to Burr Oak State Park and shares many of the same beautiful features that have made that park so popular. Elevation on the trail ranges from around 750 feet to about 1,100 feet. Most of the streams on the trail are dry during the summer and water can be difficult to find. It was a beautiful Friday afternoon when we all met at my house to get ready to go. Kevin was ready to get back out on the trail. I think he’s been bitten by the backpacking bug! My brother, Caleb, and my dog, Ruby, were also joining us on this trip. It was about 1:30 pm when everyone arrived and, as usual, it took us much longer to pack up and get ready than we anticipated. We ate an amazing lunch, posed for our group picture, and hit the road around 3:30 pm. Wildcat Hollow is about a 1.5 hour drive from Columbus, Ohio and we made good time. The trail head is well off the beaten path and can be difficult to find. Caleb and Kevin were helping me navigate the back-country, gravel roads. We were about a mile away from the trail head when, suddenly, warning lights started flashing in the dash of my Jeep. I watched as my front, passenger tire PSI went steadily from 40 down to 10. There wasn’t anywhere to pull over and I needed new tires anyway, so I just drove the last mile on the flat. When we pulled into the trail head parking lot it was packed. 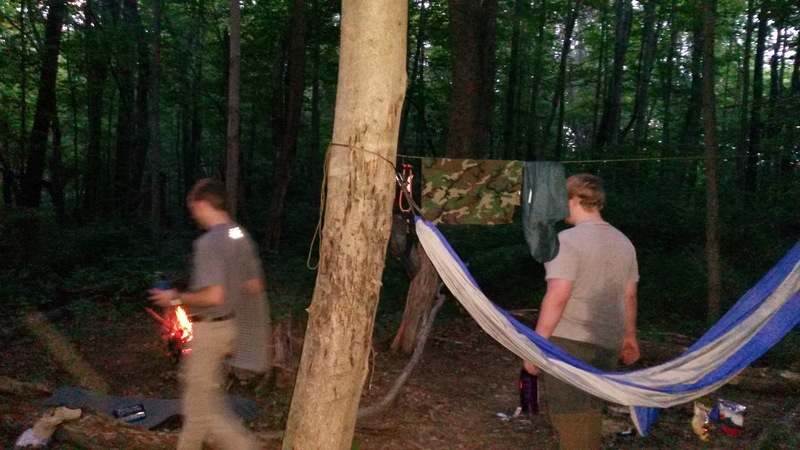 Some locals had turned the large trail head area into a drive-in camp site and were busy setting up huge tents. Kevin and I got to work on the flat tire. As if on auto-pilot, we jacked up the frame and removed the flat. As soon as we did this, the suspension released and the axle housing dropped almost all the way to the ground. Now we were in a pickle. We had the jack up as high as it could go, but we couldn’t even get the flat tire back on. So we decided to check the vehicle manual. Apparently, this Jeep was equipped with auto-leveling suspension and the jack is intended to be placed under the suspension to keep it from releasing. OOPS! We headed over to some of the other campers to ask if they had another jack we could borrow. A tall, wiry woman piped up that she had one. She led me over to the back of her fully packed minivan and began tossing things out onto the ground. Finally, she reached in and pulled out a huge two-ton shop jack. Kevin and I both laughed in surprise. It was exactly what we needed. We jacked the entire Jeep up and were able to get the new tire on. By now it was much later than we had planned to be on the trail and the party at the entrance meant that all of the close campsites were full. We put on our gear and hurried onto the trail to make up for lost time. Just a half mile into the trail, we found open campsites again and the area was no longer crowded. 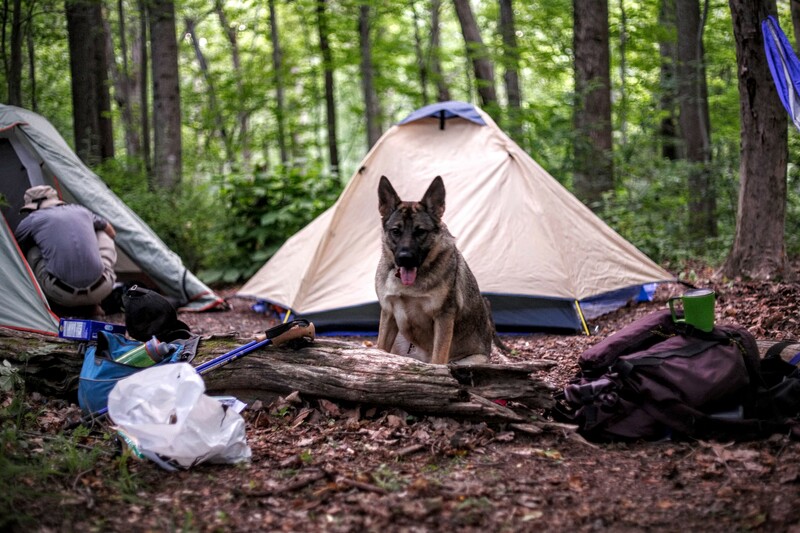 We assumed that most of the other campers weren’t planning on backpacking the trail. With the fast pace, we quickly covered another mile or so and decided to take a quick break. 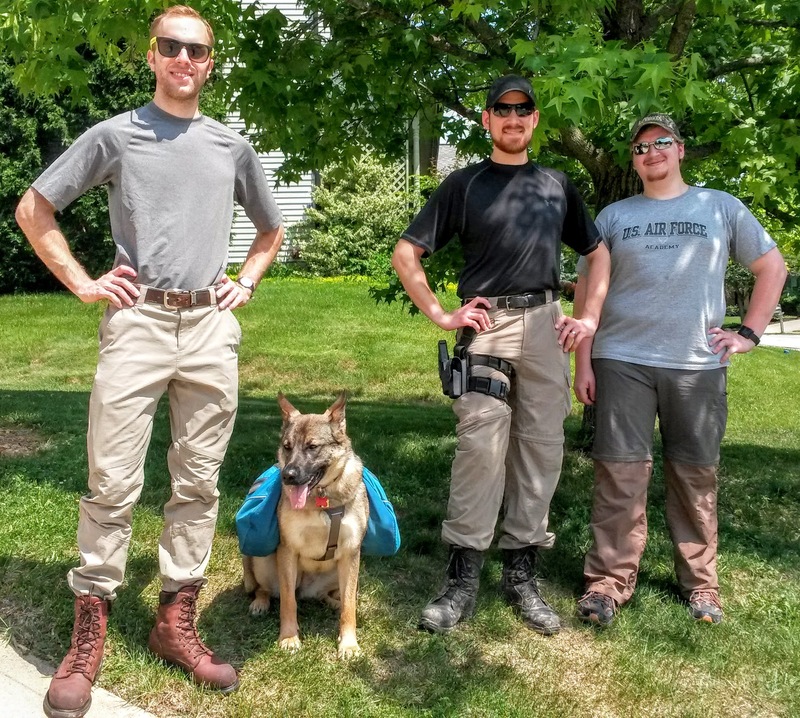 It was hot out and we needed to adjust our packs. My brother broke out huge, gallon bags of a trail mix that he had made himself. It was spectacular. Kevin and I downed enough for a full meal while we were resting. It was already getting dark so we decided to head up the next hill and start looking for a campsite. It didn’t take us long to find one and we started setting up the tents. We had covered less than three miles the first day, far less than I had planned. That was going to leave more tomorrow than expected and my brother had already told us he was feeling out of shape. We finished setting up camp and Caleb got a great fire going as Kevin and I cooked dinner. Late into the night we sat around the fire catching up, playing with Ruby, and laughing together. We finally decided that we had better get some rest before our long hike the next day. Hey Alex, I love reading your adventures. I get on a roll, excited about what’s the next thing to happen. Then, Bam! Cliffhanger. OK. I’m ready and waiting for the next installment. The flat tire was a good beginning. If life didn’t enter in and throw us curve balls, it wouldn’t be as interesting. When I asked Caleb about the weekend, he never mentioned the flat tire. Was he playing video games?!! What was your exceptional lunch before you left? Sometimes the best adventures are the ones that don’t go as planned. I’m looking forward to the next installment!